Black XTERRA Fitness TR150 is a modern foldable treadmill with a powerful 2.25 horsepower motor and a large jogging and running space, offering performance, quality, comfort and flexibility. 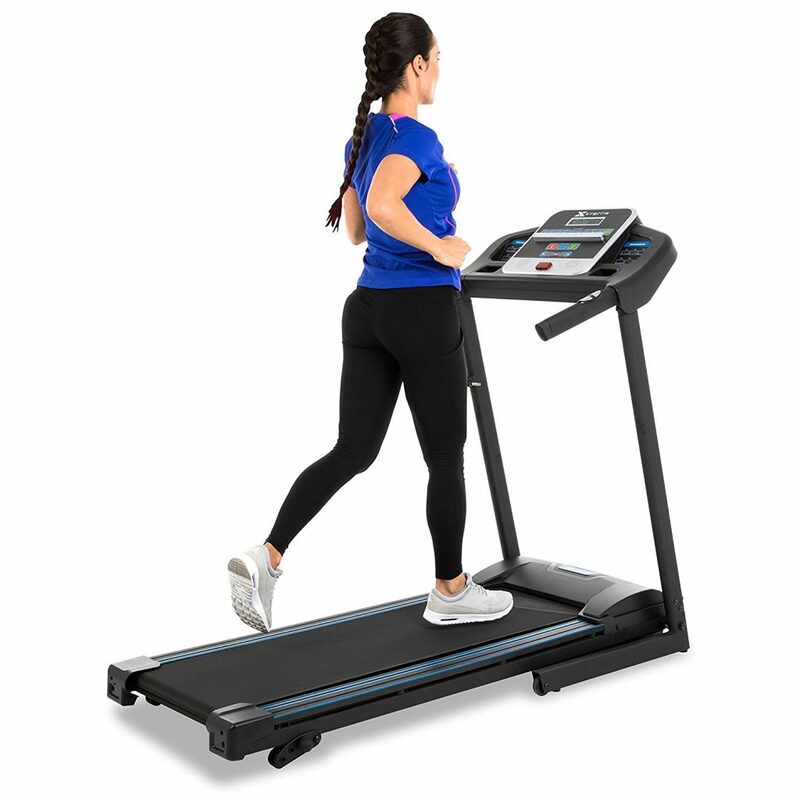 TR stands for “Trail Racer” and this great new release treadmill is also known as the Trail Racer 150. As a popular product it has already been purchased by many on Amazon.com and the current rating is at 4.1 out of 5 stars by 129 customers and almost 100 questions answered at the moment, by different customers or the support team. The 2.25HP motor runs smoothly and quietly consistently, and comes with a one-year motor warranty by the manufacturer. The running surface of 16 x 50 inches is quite large. It has a 5” smart LCD display that is easy to read where you can adjust the speed between 0.5 and 10 miles per hour. So you can start out at slow speed and move up and down to speed up the fat burning process. The LCD display has the quick touch speed buttons that gives you an easy access to 9 different speeds ( 1-9 mph) and 12 preset workout programs at varying speeds. The quick access speeds are great for interval training. You’ll be able to monitor the stats like time exercised, calories burned, distance traveled, current speed, incline and pulse rate that is linked to the sensors on the side hand pulse grips. You’ll be able to keep track of your heart rate during your exercise session, stay in the heart rate zone that is best for burning fat. You can’t adjust the incline through the display panel but there are three manual inclines that are east to adjust, for you to experience more challenge. The running deck has the XtraSoft cushioning technology to give your legs and body the best support for a low impact workout. With the maximum impact absorption on the running deck, the stress on your joints will be minimized. With the convenient folding deck design you lift the deck towards the display panel and move it on its transportation wheels. By putting in a corner of your room you will be saving on space in your living room or home gym workout area. But the bottom legs will stick out for about 2 feet, which can make it hard to fit in the closet. 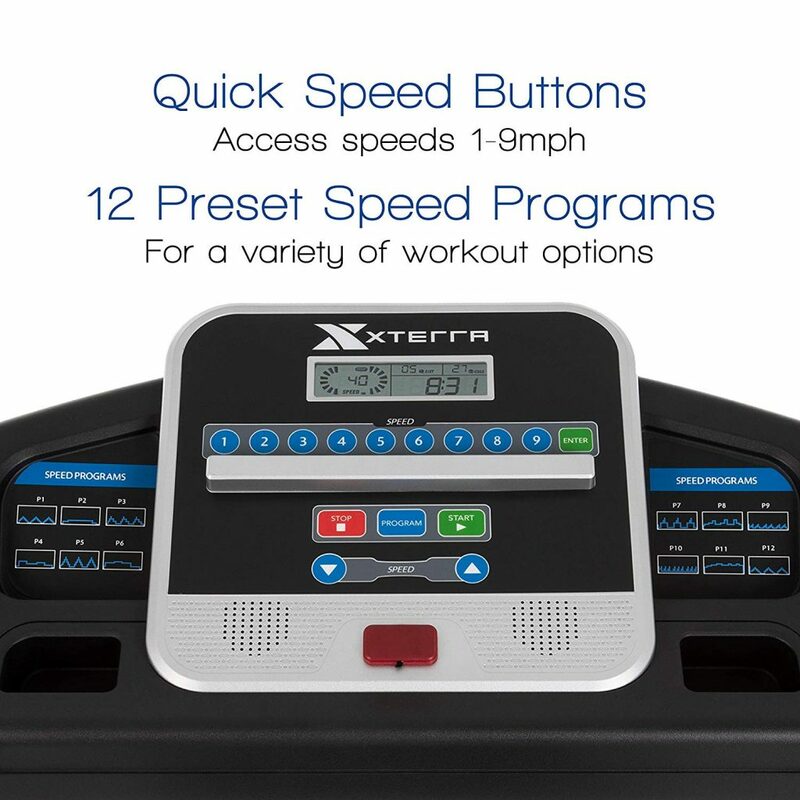 Unlike the other more expensive Xterra treadmills like the TRX2500, TRX3500 and TRX4500, this one doesn’t have the extra bells and whistles like the audio jack with speakers, cooling fan and the handlebar incline and speed buttons. It weighs 109.3 pounds, with a maximum user weight capacity of 250 pounds on its heavy gauge steel frame, and measures 63.4 x 28.75 x 51.4 inches. It measures 28.5 x 28.75 x 61 inches as folded. You have two small accessory holders for your water bottle, remote control and smart phone, and an integrated bookrack with an optimal viewing angle. It is quite easy to assemble in a few basic steps with just the tools included in the box but will be better with someone helping you out as some parts are rather heavy. A couple of customers mentioned the inaccuracy of the distance and pulse indicators on the display panel. Please note that you can’t really use the TR150 with a desk as the display panel is a bit too tall for that. You need to get a treadmill that is made up of just the running deck. With its sturdy construction, user-friendly features and functionality and the comfy and large running belt, XTERRA TR150 offers you very good value for money. Anyone complaining about the noise level should remember that this is a low-cost treadmill for all that it offers. And you can still listen to music or watch TV even when running at higher speeds. As long as you don’t have super high expectations of a 1500 dollar treadmill, then we’re sure most of you will be pleased with this unit. The warranty offered is lifetime for the frame, 90 days for parts and labor and 1 year for the motor.